This is the 20th article in the Science in Sci-fi, Fact in Fantasy blog series. Each week, we tackle one of the scientific or technological concepts pervasive in sci-fi (space travel, genetic engineering, artificial intelligence, etc.) with input from an expert. Recently, a reader asked me if I could find someone to discuss whether utilities might function in a a post-apocalyptic world. It’s the kind of question you need an engineer to answer, and I just happened to know one. Eric Primm is an engineer for Boeing and has spent the past nine years making sure the wings don’t fall off various aircraft. He writes fiction about philosophers and non-fiction about martial arts. You can find his musings on the arts on the STL Counterpoint blog. Eric and I live in the same city, and we met through the fiction writing courses at Washington University. He will forever be on my A-list for telling me to go read Scott Lynch and Joe Abercrombie (now two of my favorite authors). There exists a delicate balance in the world of fiction between just enough and too much scientific knowledge. The author must always know more about a subject than the reader, but the story needs only the information necessary to make the world feel real. To conform to reality, authors research and research and research a subject. A conversation with an expert is one research option. I say conversation because most likely the expert will have questions of her own. If a dialogue isn’t possible, then these few helpful hints will help the author ask more efficient questions. I’ve been an engineer for half of my life now1, and I’m approaching my second decade of viewing questions through the lens of engineering. It’s not a well kept secret that my profession is cautious one. This is especially true of corporate engineers where millions of dollars are at stake. Think about all the aircraft in the sky that were designed over fifty years ago. Someone had to worry about the lives on that plane far into the future. So, when someone asks an engineer a question, caution is our first approach. Let’s start with an example question for an expert: “[Would] water, telephone lines, and other utilities function in a post-apocalyptic world without a major power grid?” For an engineer, this question is simply a starting point. There are too many unknowns for a useful answer. This isn’t to say that it’s a bad question; it’s a good example for showing how normal people can communicate with engineers2. For this essay, I will assume the question is for use in the science fiction genre because in fantasy the answer can be whatever the author wants it to be. What does without a major power grid mean? Does this mean that the power stations are no longer working? Or are the power stations working but the ‘grid’ itself – the wires and transformers – are somehow destroyed? What caused the power grid to go down? For example, a hacker shutting down power generation plants has different physical consequences than if an electromagnetic pulse (EMP) is the cause of the apocalypse. Whereas a hacker can shutdown the generation of power, an EMP will fry non-shielded circuits in all electronics. Massive tornadoes could tear apart the wires while missing the power generation stations. So, the cause will change the answer. A plot synopsis is not necessary for the expert to answer the question as well. A sentence or two should suffice. The expert doesn’t need to know about the terrorists’ years of being dosed on LSD by the CIA to understand why they distributed the zombie plague upon the world. She needs to know that the power plant don’t work because instead of doing their jobs, the uninfected workers chose to hide out in their local Costco to wait out their eventual death3. Be careful of providing too much plot detail because red herrings work for the story, not for the research. The writer should expect to receive more information than needed. An expert is an expert for a reason; he has invested time and effort into his chosen profession. The information provided will contain nuggets that are important but may not be necessary for the story. Remember that the author needs to know more than the reader. Well, the expert is going to make sure the author knows a lot. It’s the author’s job to figure out what is important and what isn’t. It may take a few follow up questions to get to the answer needed. The author should avoid expecting a one stop solution. Asking an expert isn’t like googling an answer. It will provide a more holistic knowledge than just reading a webpage. Patience on both sides is the key to finding a mutual understanding. By asking the expert, a deeper knowledge of the subject is possible. To answer the question, utilities require electricity. So, if the power goes down, water will only flow for as long as the pressure in the pipes remains because the pumps that build the pressure will be without power. The electricity required to power switch boards and server farms will eventually run out leaving phones useless. Either way, if the electricity stops flowing or the paths that the electricity travels are damaged, the ending is the same. Hopefully, the expert’s knowledge make the author think deeply about the story. Because in the end, the more thought out the author’s world will result in a better story. 1. That’s a mild panic attack right there, ladies and gentlemen. 2. Yes, engineers can be normal people, too. But why would they want to be when they can play with math instead? 3. In this scenario, the power plant would eventually shut down, and the electricity used in the utility plants would shut off at some point. But the grid is not affected, and the wires inside Costco are not harmed. Thus, with a few generators, the last humans in Costco can party like Prince did in 1999. At this post, Costco should really be sponsoring this essay. 4. Try to use conflagration wherever you can. It’s a great word. Want to Hear from More Experts? Thanks, Dan, for this opportunity. I love the blog! Thanks, Eric! This worked out to be a great article. Your next one can be about wings *not* dropping off of planes. Excellent post, Eric. 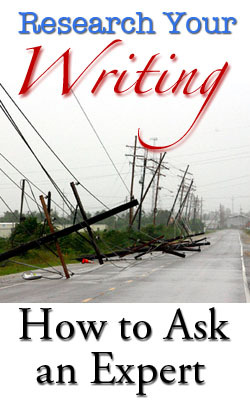 Great insights for authors on framing the questions in order to get the most helpful answers. Another great post in this series.